1921 – In first flight of airship filled with helium, Blimp C-7 piloted by LCDR Ralph F. Wood left Norfolk, VA, for Washington, DC.). 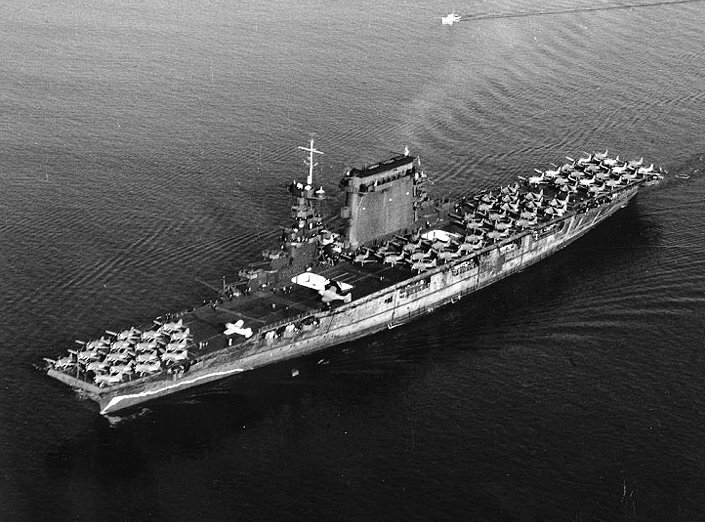 1941 – USS Lexington (CV-2) sails with Task Force 12 to ferry Marine aircraft to Midway, leaving no carriers at Pearl Harbor. 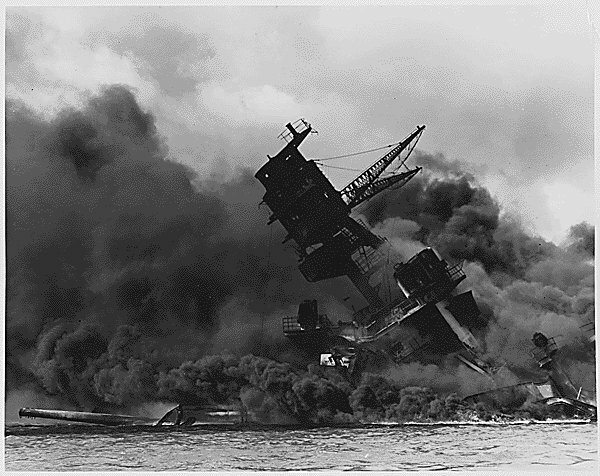 1941 – Japanese carrier aircraft attack U.S. Pacific Fleet based in Pearl Harbor, Hawaii. 1943 – Aircraft from USS Lexington (CV-16) and USS Independence (CVL-22) attack Kwajalein Atoll, sinking four Japanese ships and damaging five others, while only three U.S. ships suffered damage. 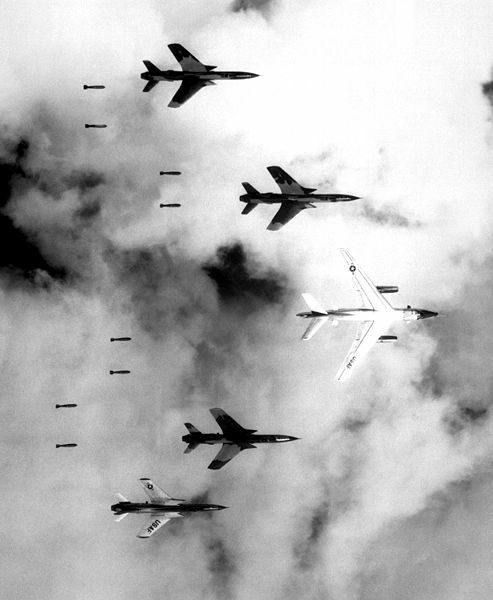 1965 – USS Enterprise (CVAN-65) and USS Bainbridge (DLGN-25) become first nuclear-powered task unit used in combat operations with launch of air strikes near Bien Hoa, Vietnam. 1983 – Two F-14s flying over Lebanon were fired upon. 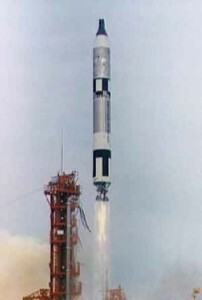 1965 – Launch of Gemini 7 piloted by CDR James A. Lovell, USN. This flight consisted of 206 orbits at an altitude of 327 km and lasted 13 days and 18 hours. Recovery by HS-11 helicopters from USS Wasp (CVS-18). 1983 – Aircraft from USS John F. Kennedy (CV-67) and USS Independence (CV-62) launch strike against anti-aircraft positions in Lebanon that fired on U.S. aircraft. Two U.S. Navy planes shot down. 1941 – US declares war on Japan. 1941 – Aircraft from USS Enterprise attack and sink Japanese Submarine I-70 north of Hawaiian Islands. A participant in the Pearl Harbor Attack, I-70 is the first Japanese combatant ship sunk during World War II. 1941 – PBY piloted by LT Utter of VP-101 shoots down Japanese ZERO in first Navy air-to-air kill during World War II. 1951 – First flight of helicopter with gas-turbine engine at Windsor Locks, CT, demonstrates adaptability of this engine to helicopters. 1972- Captain Eugene A. Cernan, USN, commander of Apollo 17, walks on the Moon. Commander Ronald E. Evans, USN, was the Command Module Pilot. The mission lasted 12 days, 13 hours and 52 minutes. Recovery by HC-1 helicopters from USS Ticonderoga (CVS-14). 1954 – First supercarrier of 59,630 tons, USS Forrestal (CVA-59), launched at Newport News, VA.
1965 – Launch of Gemini 6 with Captain Walter M. Schirra, Jr., USN, as Command Pilot. The mission included 16 orbits in 25 hours and 51 minutes. Recovery was by HS-11 helicopters from USS Wasp (CVS-18). 1907 – Great White Fleet departs Hampton Roads, VA to circumnavigate the world. 1910 – LT Theodore G. Ellyson becomes first naval officer sent to flight training. 1951 – First helicopter landing aboard a hospital ship, USS Consolation 1965 – Helicopters from HS-11 on USS Wasp (CVS-18) pick up crew and capsule of Gemini 7, after picking up the crew and capsule of Gemini 6 two days earlier. 1968 – Launch of Apollo 8 with Captain James A. Lovell, Jr. as Command Module Pilot. During the mission Lovell was one of the first two people to see the far side of the moon. The mission lasted 6 days and 3 hours, and included 10 moon orbits. Recovery was by HS-4 helicopters from USS Yorktown (CVS-10). 1972 – Mining and bombing of North Vietnam resumes with Linebacker II Operation. 1998 – Operation Desert Fox in Iraq ends. 1941 – Admiral Chester W. Nimitz arrives at Pearl Harbor to assume command of U.S. Pacific Fleet. 1942 – Commissioning of USS Essex (CV-9), first of new class of aircraft carriers, at Norfolk, VA.
1941 – Admiral Chester W. Nimitz assumes command of U.S. Pacific Fleet.